John played clarinet, tenor sax, and basset horn in the band from 1998 to 2006. John’s father ran a pub and encouraged musicians to play there, so John was brought up with music all around. By the age of 16 he had started playing along (on the clarinet) to musicians like Fats Waller, Albert Nichols, and Kid Ory. 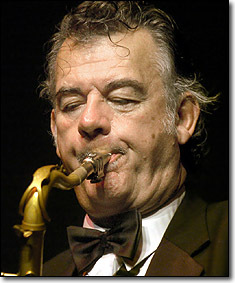 Barry Martyn (band leader and drummer) asked John to play clarinet in his band, as his reed man had left, and by the time he was 20 John was touring the United States. He spent a month in New Orleans and became influenced by what he heard whilst in America, playing with many well-known musicians. In Europe he became a protégé of Albert Nicholas, and they recorded an album together. Later he also took lessons from Barney Bigard whilst in the States in the 1970s. Before joining Keith Smith’s Climax Jazz Band in 1962, where he stayed for three years, John had played in the New Teao Brass Band and “Uncle” John Renshaw’s Band. He led his own Creole Jazz Band (1966-1967) and played in John Keen’s New Orleans Band (1968). By now John had also taken up the tenor sax, and often played with Mike Casimir’s Paragon Brass Band in the late 1960s and early 1970s. During the early 1970s he played with Barry Martyn, Pat Hawes, John Chilton, and others. He also depped with Ken Colyer. In March 1973 he joined drummer Trevor Richards’s New Orleans Trio (the pianist was Bob Barton). The group toured internationally, and played for long periods in the United States. In January 1977 the three members were involved in a car crash while touring Poland, but were able to recommence touring a year later, and carried on for a further four years. From 1981 to 1984, Bob Barton and John co-led “Super Jazz”. They did various tours with American musicians, including Louis Nelson, Alton Purnell, and Freddy Kohlman. In the mid-1980s John was asked to join Papa Bue’s Viking Jazz Band. He learned to speak Danish, and stayed for some twelve years until replacing Ian Wheeler in the Chris Barber Band in 1998. In addition to his solo and ensemble work with the Big Chris Barber Band, John was also the featured clarinettist in the re-creation of the original six-piece Chris Barber’s Jazz Band, being heard to advantage in the Monty Sunshine role on such numbers as “Precious Lord” and “Wild Cat Blues”. Back to the Former members of the band page.